The Most Authoritative Resource in the Field of Eminent Domain Since 1909. Answers Practically Every Question On Eminent Domain. This definitive treatise on the law of eminent domain discusses: the origin, characteristics, nature and extent of the power of eminent domain; valuation and damages; preparation of claims and negotiations; and the passing of ownership and the nature of the title acquired. Guides You On Every Aspect Of Valuation. You'll get all pro or con arguments that can be raised to influence valuation, including: market values; damages; proposed use; amount of award; income; improvements; sales and offers. Speeds You To The Cases And The Facts. A comprehensive index is included and decisions are footnoted and arranged both alphabetically and jurisdictionally for fast and easy access to any case or topic you need. 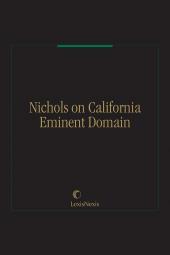 The only combined treatise and practice guide encompassing all topics in the field of eminent domain for all jurisdictions, Nichols on Eminent Domainis the most comprehensive work available and answers practically every question on the subject.